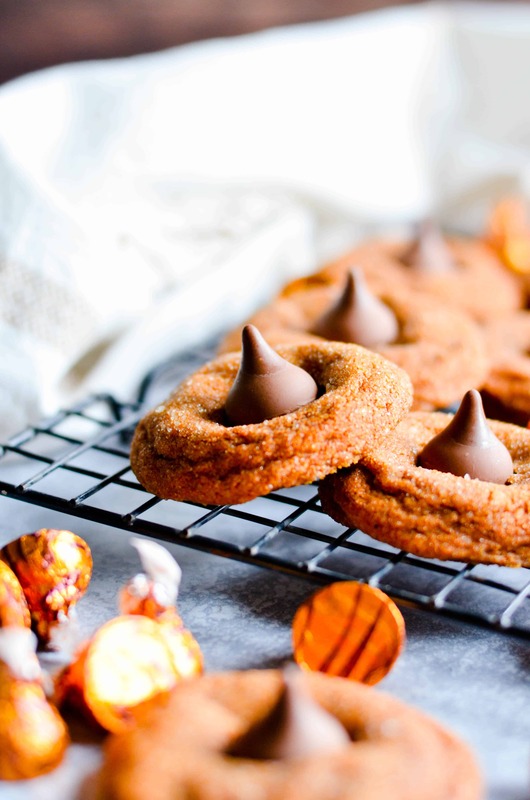 Pumpkin snickerdoodles with a caramel kiss pressed into the middle. 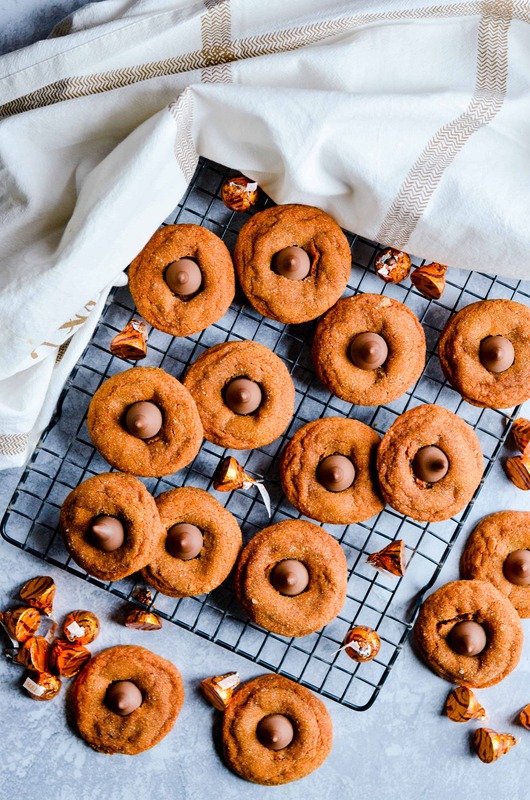 These Pumpkin Caramel Kiss Cookies taste like Fall and are so yummy! CHECK OUT MY FAVORITE PUMPKIN RECIPES ON FACEBOOK + GET SNEAK PEEKS OF RECIPES & PHOTOS IN MY FB RECIPE GROUP! Where do I find pumpkin spice pudding mix? 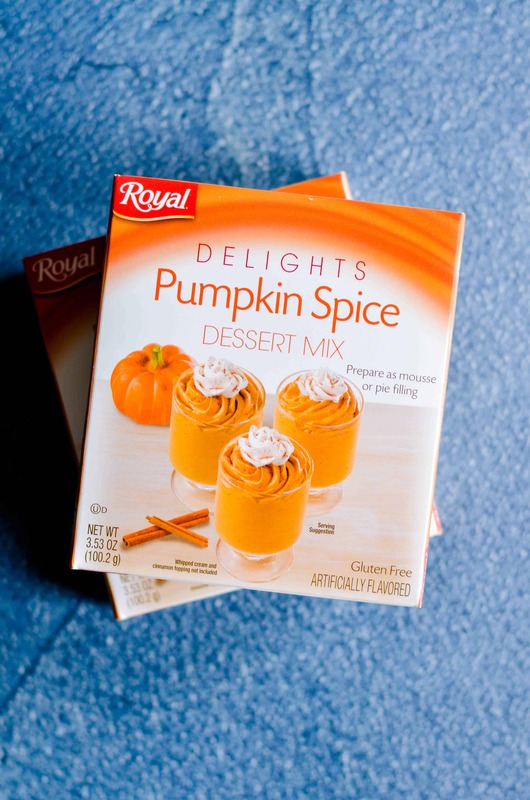 For the past several years, I’ve seen plenty of Jell-O brand pumpkin spice pudding mix at Target and Walmart. This is the first year in a really long time that I haven’t been able to track it down!! 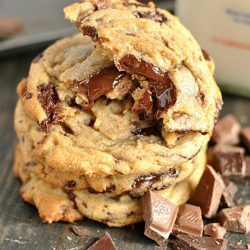 I was panicking at first– because my very favorite pumpkin chocolate chip cookies HAS TO have pumpkin pudding mix in the dough. Get your Fall Baking on with this Salted Honey Pie Video! Melt the butter for 60 seconds in the microwave. Whisk in the brown sugar and sugar. Add the egg, pumpkin, and vanilla and mix well. Add the baking soda water. Combine remaining dry ingredients together and gradually add to the wet mixture. Scoop 2 tablespoons of dough and roll into a ball. Coat the dough in the cinnamon sugar and then place onto ungreased cookie sheet. Bake for 9-10 minutes. 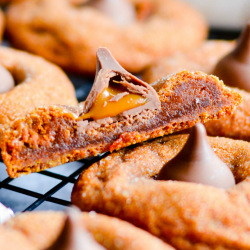 Immediately press a Hershey Kiss into the center of each cookie. 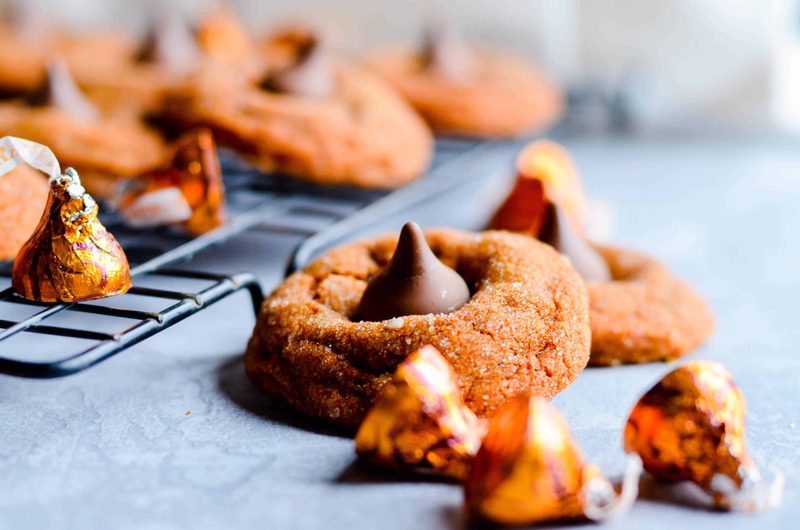 Place cookie sheets in the refrigerator while cookies cool, so that the Kisses keep their shape and don't melt. Love Pumpkin Cookies? Me too! These are my favorite Pumpkin Cookie Recipes. i went through the directions a few times and i couldnt see where it said that i needed to add the vanilla extract? How much is a “stick of butter”??? How many cups or ml is that? For the Pumpkin Caramel Kiss Cookies – 3 3/4 cups flour seems like a lot of flour for 36 cookies. Is that the correct amount? 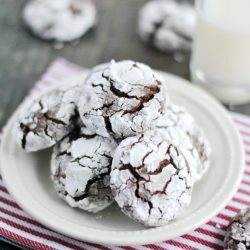 I followed this recipe for these cookies and loved how they turned out. I thought it was too much flour too, but was pleasantly surprised at the pumpkin flavor that was totally there! Having said that, one person left a comment saying they thought it tasted too flour-y. THANKS SO MUCH! I WILL GIVE IT A TRY. Way too much flour! It masks the pumpkin flavor…and you didn’t include the vanilla in your recipe instructions. Do you know where to do buy cinnnamon sugar? We couldn’t find any and no one knew what it was. Hi there! I believe you CAN buy it in the spice aisle at grocery store, but I always just make it! 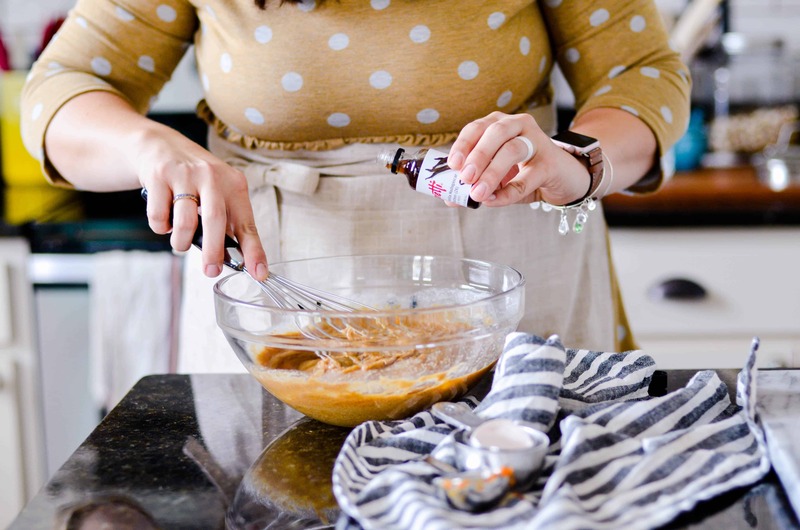 The general rule of thumb is about 1 cup of sugar to about 1 tsp cinnamon– but you can change that up to make it as cinnamon-y or as sugar-y as you want! I made a batch of these last night for a cookie exchange (my original cookie choice was a huge epic failure). They came out amazing! I was a little concerned with the amount of flour in the recipe but once everything was mixed together the amount was perfect. If you use less then the 3 3/4 cups you get a very soft, messy dough. My son gave these an enthusiastic 2 thumbs up! These will definitely be added to my “must make” list! so when you say a stick of butter, does that mean one of those small sticks or a full-size stick? thanks! i plan on making these very soon! My daughter and I made these over the weekend and we decided that the next batch we will add less four. Too much flour not enough flavor. We love the concept of the pumpkin meets chocolate caramel. Thank you for the recipe. Hm.. I honestly don’t know! It sounds more like some sort of connection problem… like, maybe there’s a plugin your browser doesn’t support or something? ack! Sorry– I wish I knew more and could help! Maybe try copying and pasting the recipe into a word document and printing from there? Or you could maybe subscribe to my site’s emails? And then print the emails when there’s a recipe you want to print? is there anything I can use instead of the shortening… I have a list of nightmares that include Crisco so if I could use oil or more butter instead it would be ideal… any thoughts? These were GREAT! I made them for a safari club fundraiser (I go to vet tech school) and people loved them! Only thing I did different was use a bit less flour. I made these last night. Im not sure what i did wrong, but mine came out dense and not like the picture. yours look fluffy, mine were not. i followed the directions exactly as they are written. I also stored them in a covered container and they have become kind of mushy. maybe its the pumpkin, maybe i needed to cook them longer. i dont know. they are still really good though. I never have been known for following directions very well. That being said I replaced the shortening with apple sauce and Caramel Kisses with Pumpkin Spice Kisses. My husband loved them. I will say that with the flour they are not real sweet and he liked that about them. They kind of have a pumpkin bread texture with a little treat on top.I would definitely make them again. Hate to ask an obvious question, but did you put the kisses on AFTER they came out of the oven? I agree with using less flour. My family and I found the cookies to be pretty bland and dry. I also refrigerated the dough so it would be less gooey when rolling in the cinnamon sugar. Too much flour or not enough sugar, and it made 50 cookies. Not sure if you actually tried this recipe? They were dry and not sweet, I’m sorry I wasted my time on them. Of course I actually tried the recipe– where do you suppose the pictures came from? I’m sorry you had a bad experience! I made these for a cookie swap and they came out very tasty! I did alter the recipe slightly after reading the comments. I only used 3 cups of flour and added an extra tsp of pumpkin pie spices. I also opted not to use the cinnamon sugar, but I think I will make them again with it. Thanks for the great recipe! Do you think these would freeze well or last a week? I’m starting to make cookies for Christmas and am trying to plan it so I’m not making them all at once! Followed the recipe exactly as written. They had no flavor, couldn’t taste the pumpkin at all. Waste of time, they all went in the trash. Such a disappointment. Thanks Donna! I’m so glad you liked them :) Sometimes it can be hard trying to please everyone, but I think I’ve learned that recipes are a tricky thing if you take into account so many different tastes and preferences and kitchens! I take most negative comments with a grain of salt. But I love getting positive ones!! I was really excited to make these but disappointed with the taste. They taste more like a biscuit than a cookie. 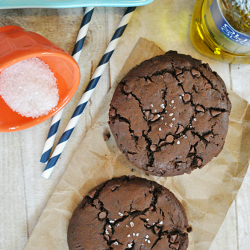 I like the idea of this recipe and wonder how it could be modified to taste more like a cookie? Also, once cooled don’t store in a sealed container, the cookie becomes soggy by the next day. I made these cookies for my cookie exchange this year. I was unsure because of the comments in regards to having too much flour, and no flavor. I reduced the flour to 3 cups. As for the pumpkin pie spice , I used 2 teaspoons. For the sugar dusting, I also used pumpkin pie spice. These cookies are amazing, perfectly tender, excellent pumpkin flavor!!! Will definitely be making these again. I was unsure about these cookies because of the reviews, so, I reduced the flour to 3 cups, and bumped up the pie spice to two teaspoons. I also, changed the cinnamon sugar mixture to pumpkin pie spice mixture. These cookies were amazing, perfectly tender, fluffy. I’m not sure why people say they have no flavor. they were excellent!!!! will definitely be making again. Mine still seemed sticky with the amount of flour used so I actually added more. We will see what the end result is!